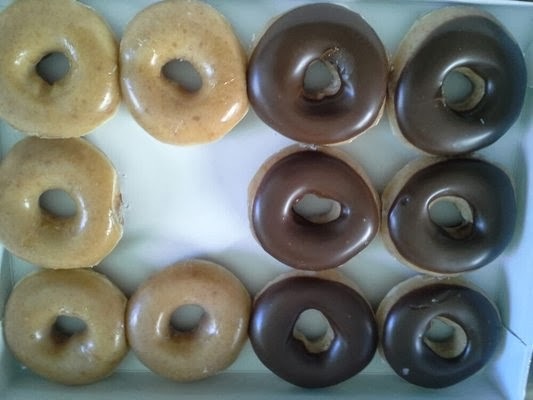 (WARNING: This post will contain commentary about kitchen countertops, doughnuts and rock ballads from the '80s ... and the post writer will try to connect all three. Those with weak constitutions may want to click off now). 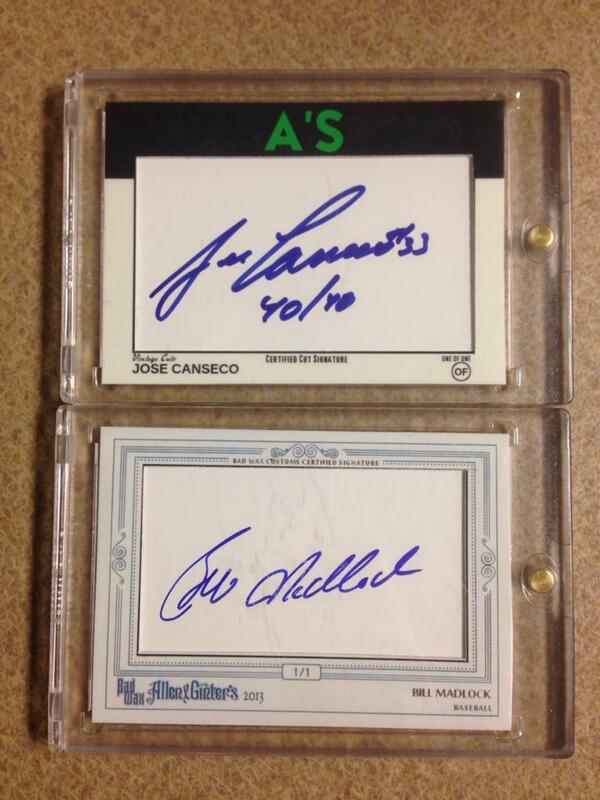 I was half paying attention to some 2014 Panini Donruss breaks yesterday on Twitter. 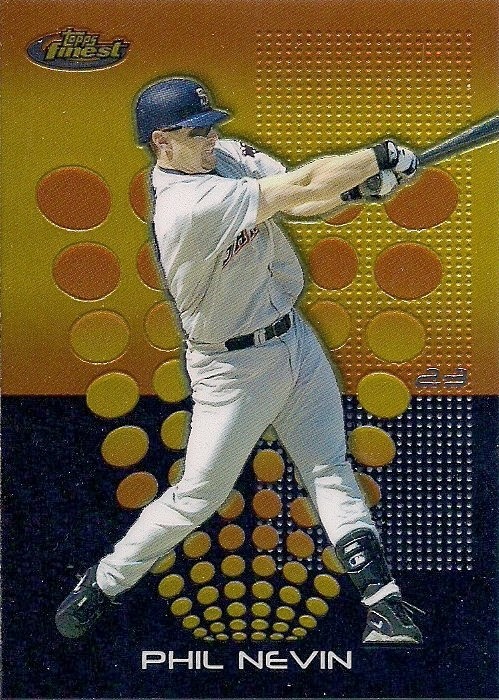 Sure, I know some of you weren't even aware that there was a Panini Donruss set. But, trust me, the collectors who must have the latest and greatest NOW were aware. 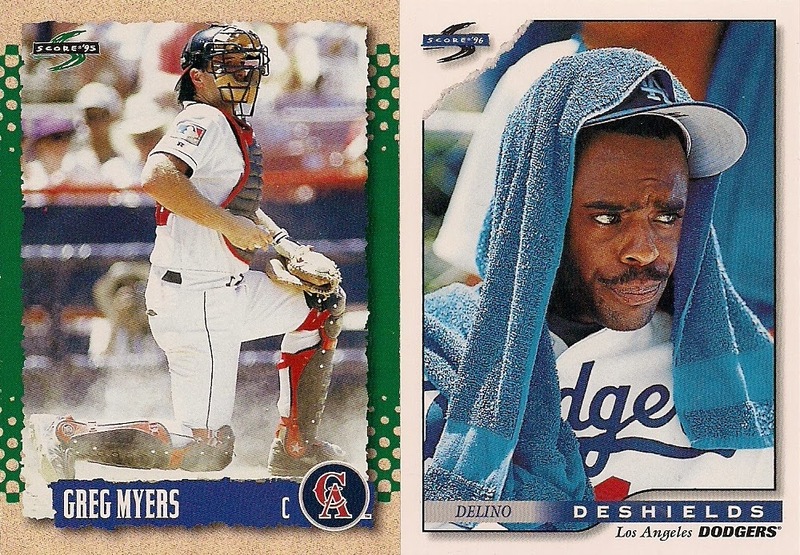 I may be wrong in my perception -- because like I said, I was half paying attention -- but it didn't seem like the Donruss breakers were all that satisfied once all the wrappers were open. There were collation issues. And short-print issues. 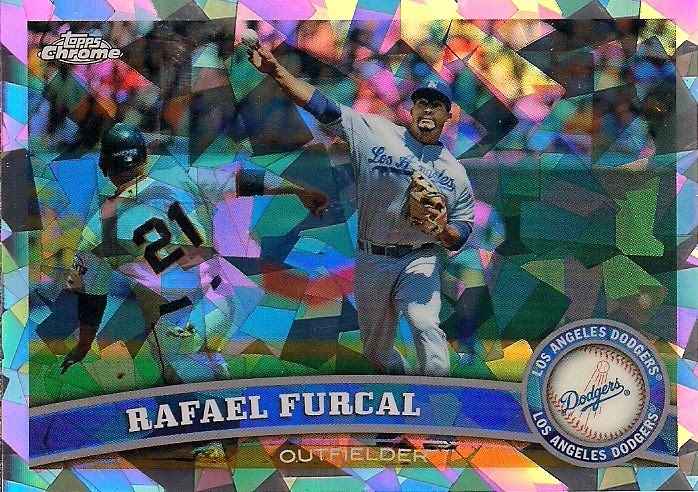 Lots of short-print issues (I have no idea why Panini baseball -- a company that can't even get half the collectors to give it the time of day -- is short-printing things). It made me sad for just a brief moment for the box breakers. 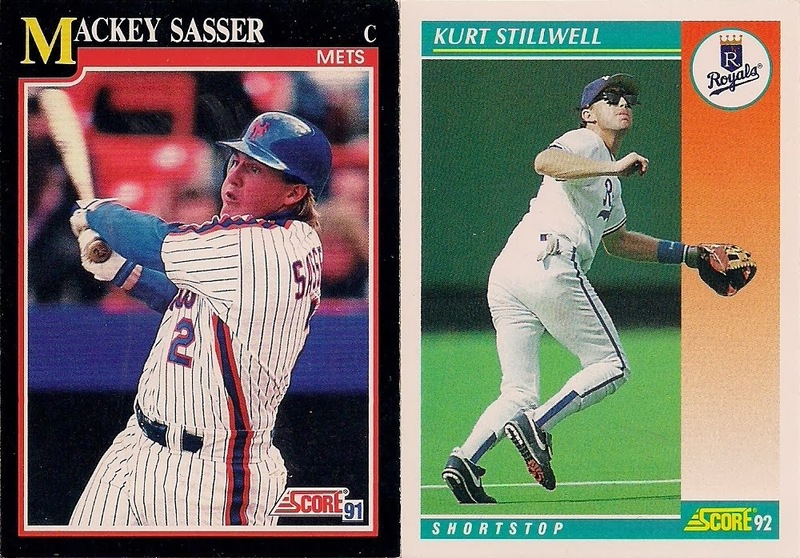 And I began to remember all the issues that come up when you invest your hard-earned money into a hobby box. There are not only collation issues and artificial scarcity issues, but also the plain dissatisfaction of pulling cards you don't necessarily want. I'm sure you know what I mean. I can't be the only one who has finished off a box and then felt ... hollow. Then my mind veered in a different direction. I was out looking at countertops for the kitchen the other day. As I walked past cabinet after cabinet, my mind glazed over, kind of like it does when I stare at HGTV for more than 2 minutes. But then I noticed something on a display wall. 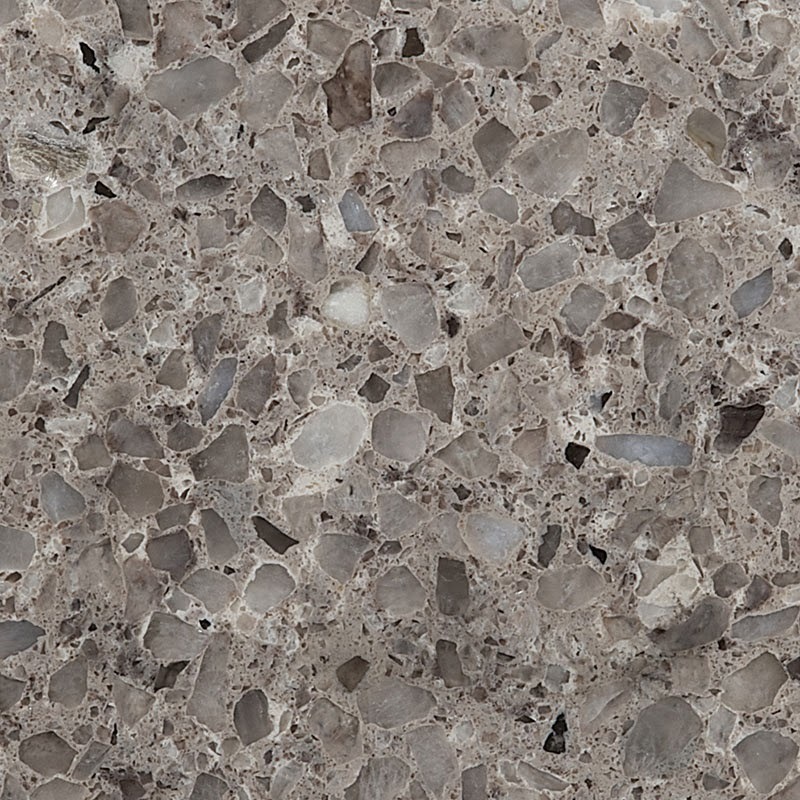 It was columns and columns of countertops samples. In all kinds of colors, shades and consistencies. Probably like 70 or 80 different samples. I wanted to collect them all. Right there. Grab a sample of each. Then leave the place and come back a couple weeks later and see if there were new ones. And then collect them. Good gosh, I have a problem. I decided to air that problem on Twitter (what else is Twitter for?). And there were collectors who understood. And they began to crack wise about countertop hobby boxes. And I began to crack wise about the collation issue in a countertop hobby box. And then I started wondering about other consumer goods that come in different varieties. And what if those consumer goods were as horribly presented as hobby boxes seem to be these days? You think card collectors freak out because they received three Ben Zobrist cards in the same box? Try messing with a doughnut order in a similar fashion. Perhaps instead of being shorted a pack in your hobby box, you were shorted a doughnut in your doughnut hobby box. You think anybody's going to stand for that? Hobby boxes are messed up. 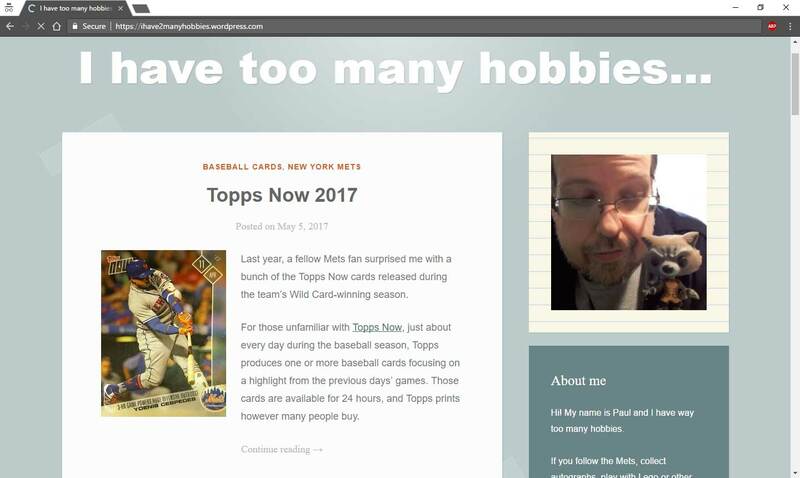 And especially if Panini -- who doesn't have 50-plus years of experience behind it, not that it makes it right when Topps does it -- is screwing them up. That ain't good. I honestly don't know if I'll buy a hobby box again. It doesn't seem to be worth the gamble. And when I think of how furious I'd be if other things I bought were offered like the cards I bought, it makes me not want to buy a hobby box on principle. So I wanted to point out the opposite of a hobby box. If a hobby box involves receiving lots of cards for a wad of money but doesn't satisfy because you pull a bunch of cards you don't want, what is the opposite of that? 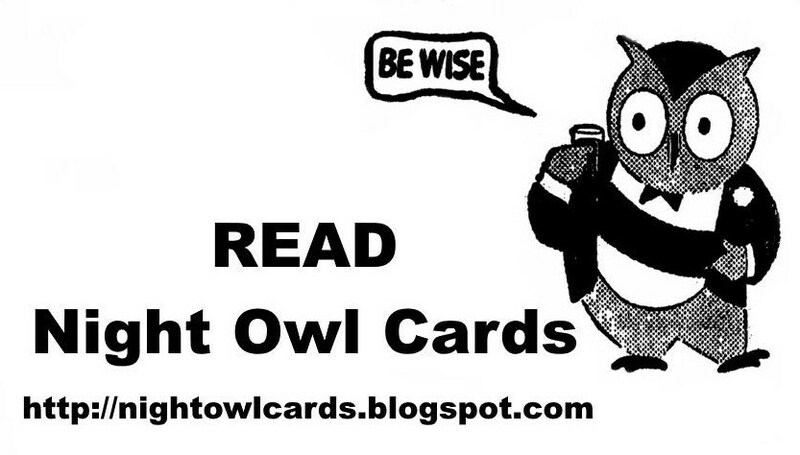 I guess the opposite is getting a single card, for a minimal amount of money, that you definitely do want. One card. Mailed to me. From Marcus at All The Way To The Backstop. And it's something I want. That is efficiency and productivity that a hobby box can't match. One card. Mailed to me. From James. He's active on Twitter. He's also on the blog Unabashed Interest, and he definitely sent a card I want. Love that atomic action. My chances of landing an atomic Dodger in a hobby box of Chrome is almost non-existent. One card. Mailed to me. From Tom of The Angels In Order. 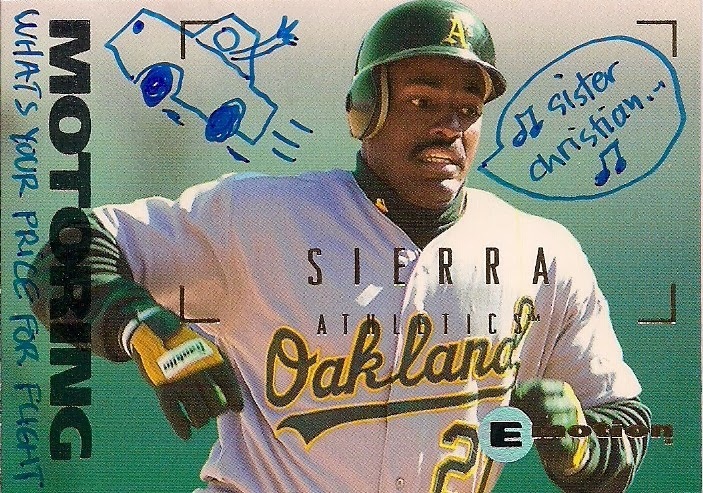 I wanted this card because Tom did a riff on Night Ranger's Sister Christian when he displayed this card on his Skybox E-motion blog. I thought it was so appropriate -- the perfect harmony of an odd song and an odd set. Those doodles are written right on the card, baby. 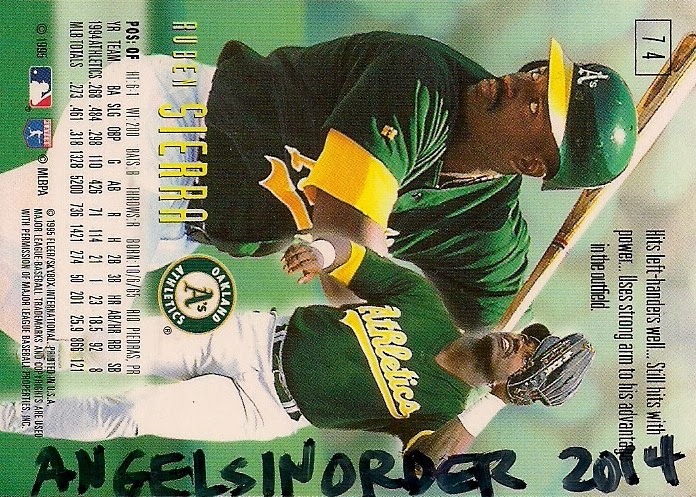 That's a 2014 Angels In Order 1/1 right there. And that is something that you can't find in a hobby box. I still say the most enjoyable way of working one's way through this hobby is not through a hobby box and the flurry of packs and barely looked at cardboard, but taking a more methodical pace. Enjoying the sights and the journey, bit by bit. We got hit with another surprise snowstorm today. One of those deals where you go to bed and all is clear and then suddenly they're releasing kiddies out of school early because nobody can see ANYTHING. 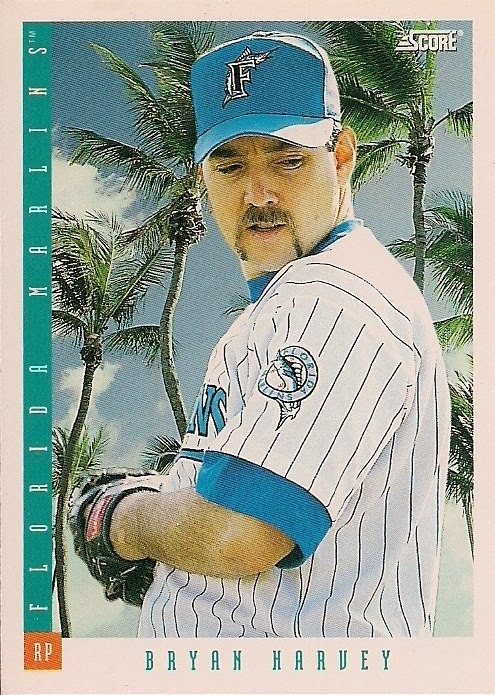 So I've got a card with palm trees on it to remind me that there are people playing baseball somewhere. It sounds totally preposterous, but that's what people are claiming. 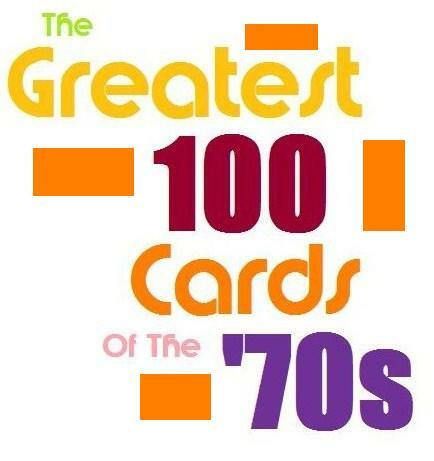 The card is also the lead-in for the big voting session in which we select the year-to-year biggest bust and biggest improvement during Score's 11-year reign as a baseball card producing company. As usual, opinions varied when I asked for comments. And you'll see sets that are considered both busts and improvements depending on who you ask. Yep, that world peace thing is a pipe dream. 1989-90: Probably the "biggest improvement" candidate that received the most mentions. Several said they didn't necessarily have an issue with '89 Score (which is nice because I have a soft spot for it), but that they liked 1990 Score so much. 1990-91: But some people didn't think 1990 Score was enough of an improvement. 1991 Score is a lot better they say. I feel conflicted about both sets. 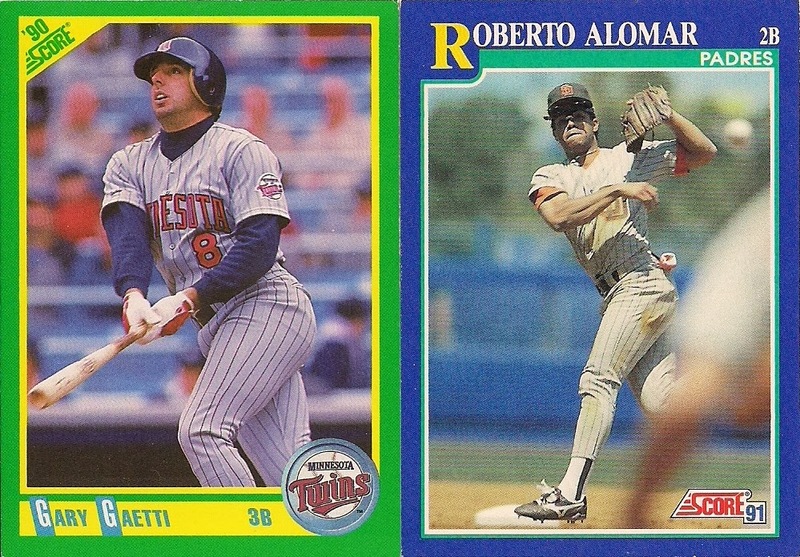 1990 is OK, but gosh that green-and-yellow is awful. And 1991 is OK, but don't be coming at me with that turquoise. 1992-93: Thank you kind people who mentioned this comparison. This is the one that I would pick, although I know it won't win. I detest 1992 Score, and I like 1993 Score. I think it might because there is virtually no yellow in '93 Score. 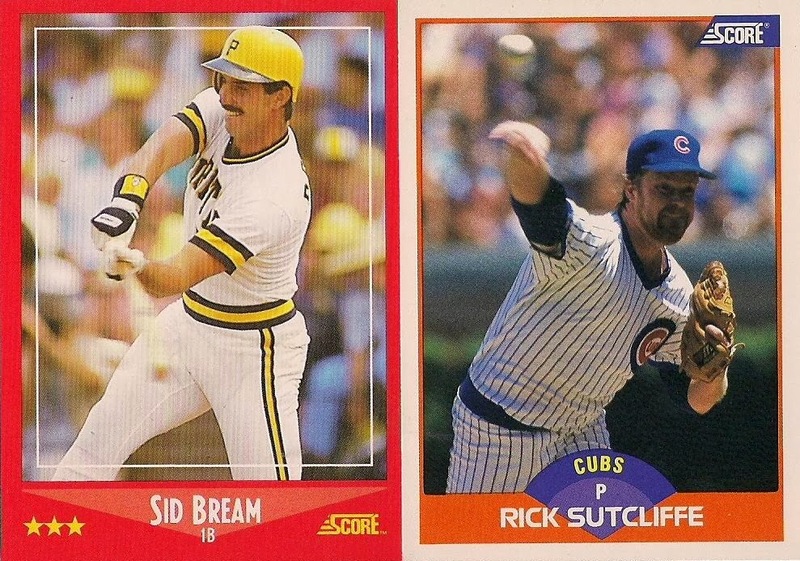 With certain small exceptions (not you, 1991 Fleer, sit down), I do not like yellow on baseball cards. 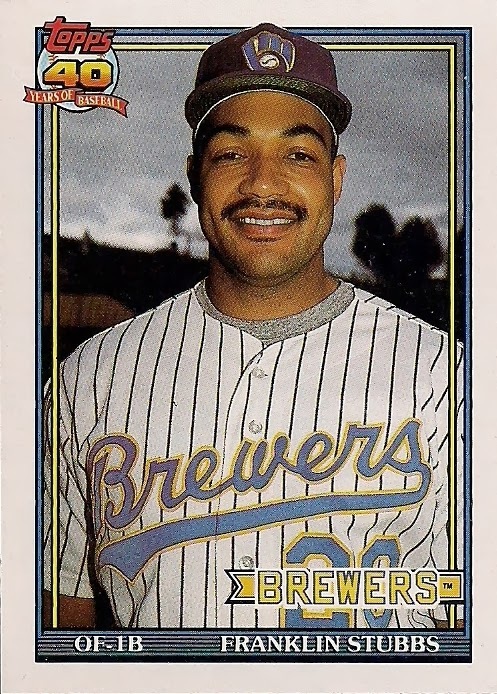 1994-95: This will appear again in the "biggest bust" category. 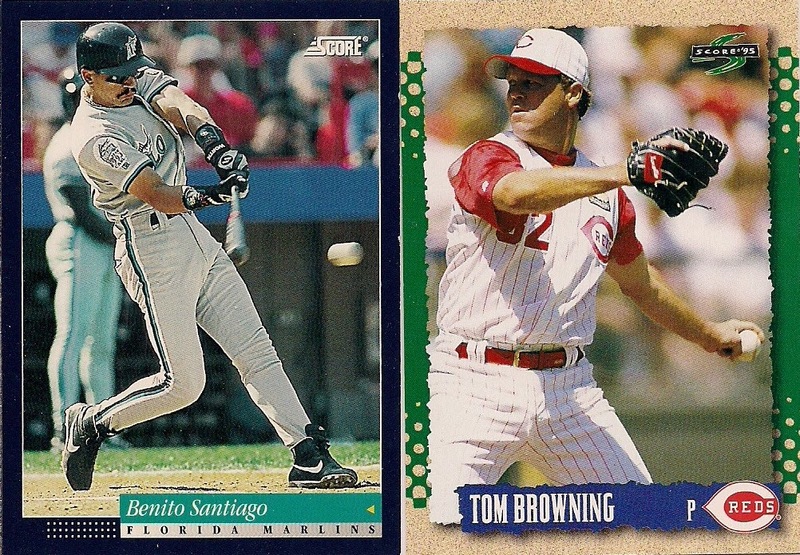 I'm not clear on why '95 is an improvement over '94, but I will say 1994 had too much gloss. 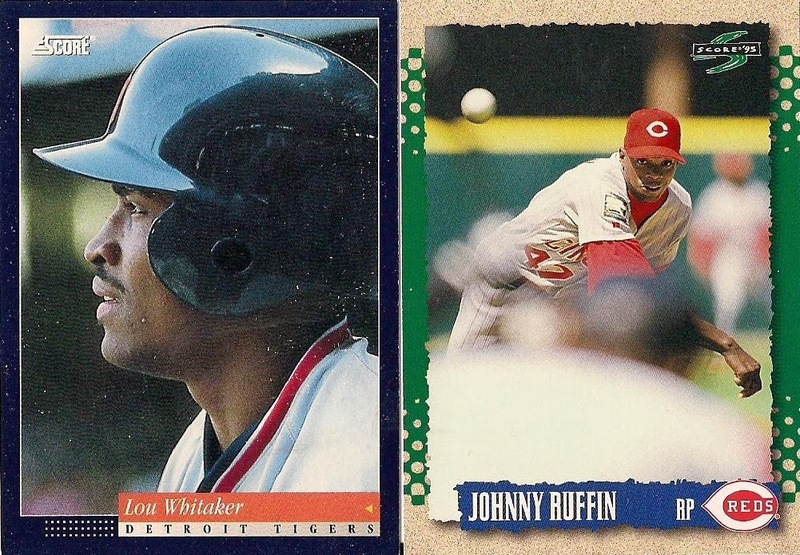 You can see the Whitaker card took a hit because the '94 cards get too sticky. 1995-96: Lots of folks don't seem to like '95 Score. 1996 Score is much more minimalist than '95 so I can see the preference. 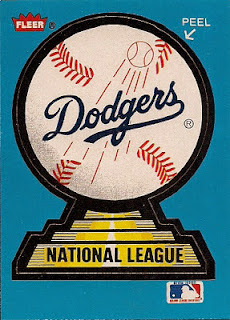 1988-89: The reasoning behind this is 1988 Score was the first, the best, the everything (to paraphrase Barry White). Anything after it is meaningless. 1990-91: Ah! Turquoise! Get it away! Get it away! 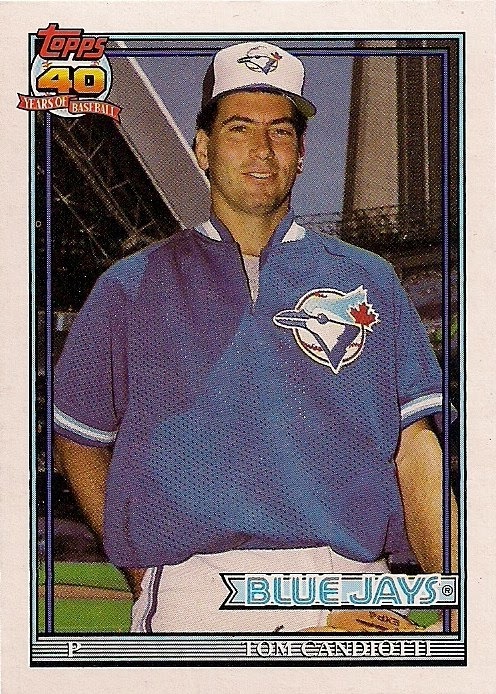 1991-92: I'm not exactly a fan of 1991 Score, but, yes, compared with the hideous orange, purple, turquoise and yellow of 1992, I'm right on board with this one. I can't even focus on the photographs on '92 Score because of all the ick. 1994-95: Lots of mentions for this one. 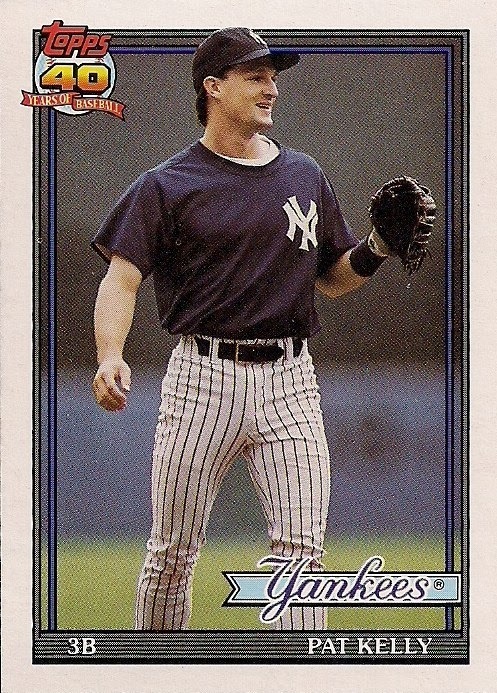 The '94 set has the classic midnight blue design. But 1995 Score is for the dirt bike crowd. Generations are clashing! 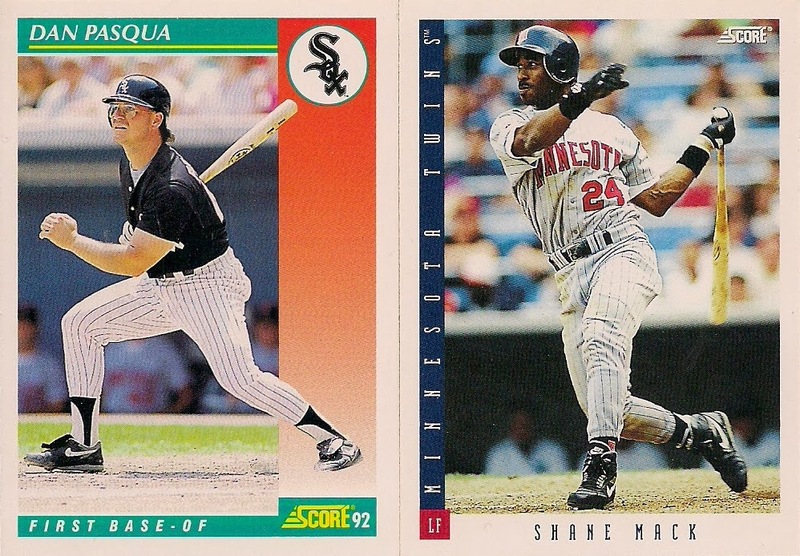 1996-97: On the surface, these two sets look alike. But I agree with collectors who believe that '96 Score is more pleasing. 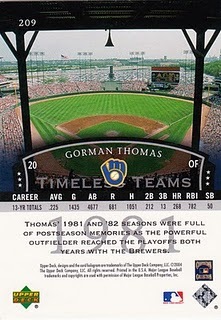 And if that won't convince you enough, just flip over a 1997 Score card. It's a text-assault on the senses. So those are your candidates for Score. You may have noticed that every Score set was mentioned here except for 1998. I've rearranged the layout on the sidebar again to include polls. It makes my OCD act up, so please vote for your favorite as soon as you can so I can get rid of the polls and return to my starry starry night sidebar background. 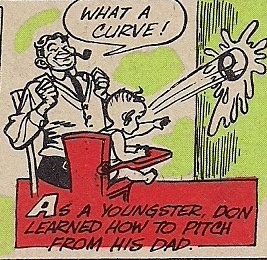 I enjoy looking at baseball card cartoons almost as much as anything else having to do with this hobby. 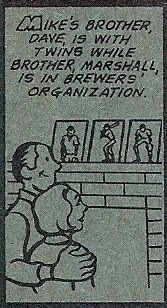 That's why I can't for the life of me understand why cartoons don't show up on the back of baseball cards every stinking year. And don't come at me with Heritage. We all know they recycle the same 12 cartoon images each year. 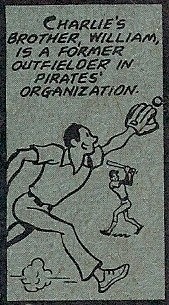 As I've said many times, I learned a whole lot looking at the cartoons on the back of my cards while growing up in the '70s. I often wonder if kids who grew up with cards in the '80s learned as much because, wow, that was a decade barren of cartoon images. 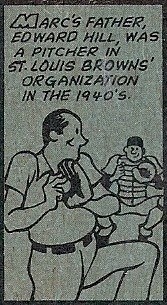 I knew this factoid before I even knew who Wes Parker, Jim Lefebvre, Maury Wills and Junior Gilliam were. And I have the 1976 set to thank. That's a valuable piece of information right there. Impress your friends. Baffle your enemies. This one takes a long time to get through, but I bet you didn't know it. And, look, all the grandsons have baseball cards of their grandfathers. 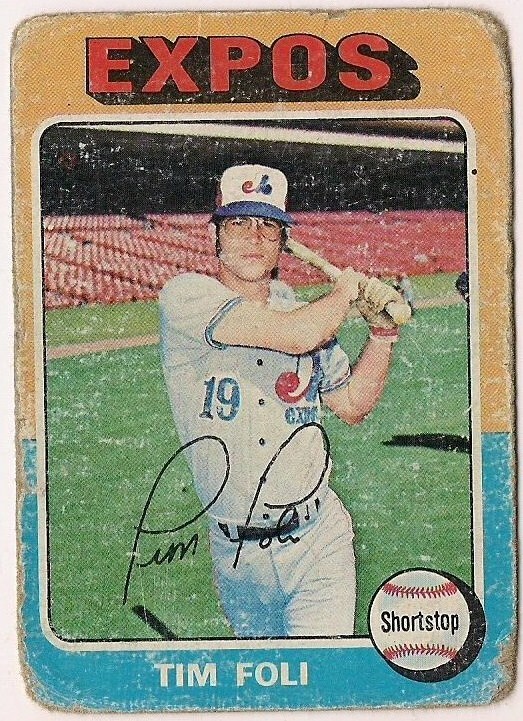 1976 Topps wasn't the only set that included almost forgotten facts. 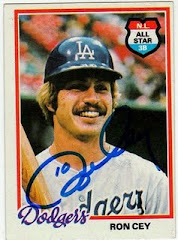 1972 Topps was good for that, too, just in a lot tinier type. That's a fascinating bit of information and I'm filled with all kinds of questions after reading this. Why were they playing a game during a flood? How was Ted Menze able to run in rubber boots? If I had time to research maybe I'd have an answer to these very serious questions. 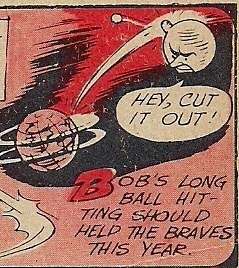 While sets like '72 and '76 contain baseball historical facts in their cartoons, other sets stick to more present day players. 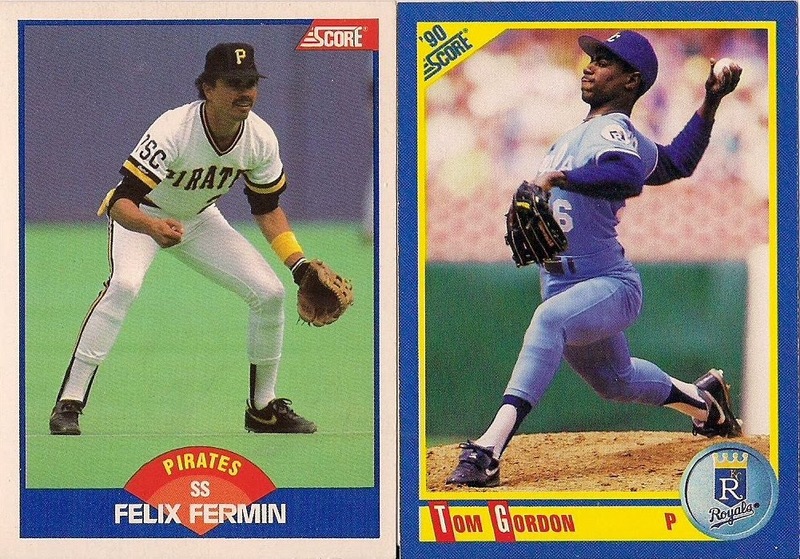 The 1980 Topps set does that a lot. 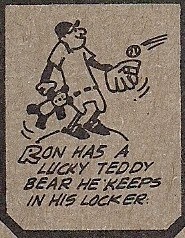 Probably the 1974 set does that the best, because not only are the cartoons referring to the player featured on the front of the card, but a lot of them give some key tidbit about their personal life. I am totally not surprised that this is Bobby Valentine. 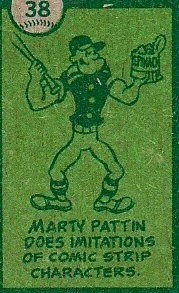 The 1980 set mentions a lot of player exploits in its cartoons. So there are a lot of trophies and pictures of a player looking at his accomplishment in the newspaper. Those get a little boring. 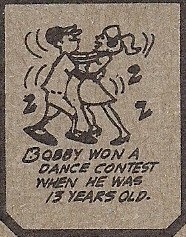 Another feature of the 1980 cartoons are family relationships. Such-and-such player has a brother or father who played in the major leagues. There is a lot of male-pattern baldness going on. 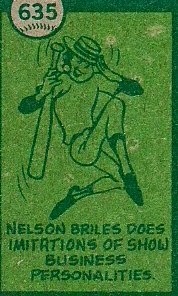 My favorite cartoons come from two specific sets -- 1956 Topps and 1977 Topps. If I had more 1973 Topps, I'd probably lump those in, too, but that'll have to wait for the day when I beef up that collection. Players have a lot of free time on their hands. 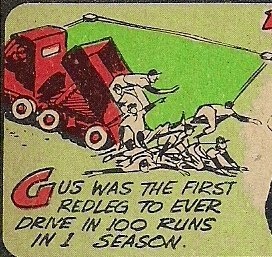 But the 1956 Topps set conquers all in everything. 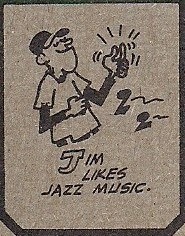 There are hundreds of examples of 1956 cartoon greatness. 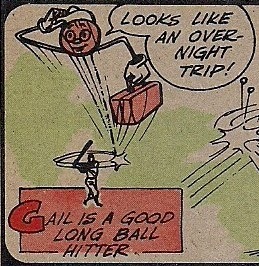 Included in that is how many ways the cartoonist(s) illustrated how far a player can hit a ball. There was no repetition or recycling in these cartoons. Oh, no. .. or knocked it into the solar system. 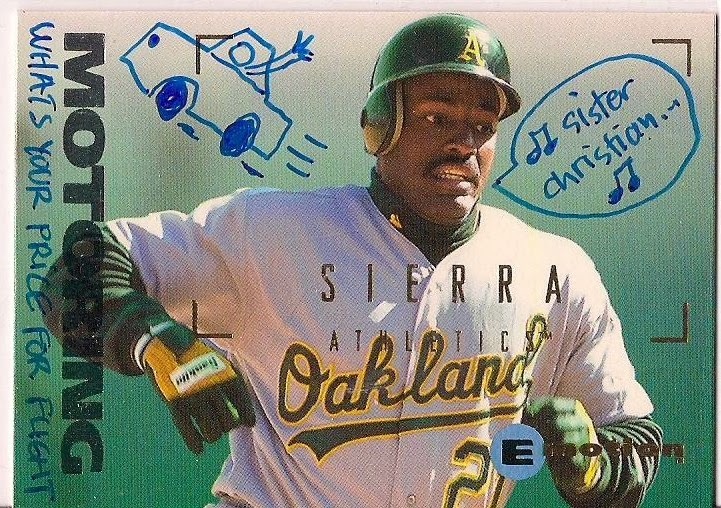 Baseball card cartoons are great because they are artistic, creative and informative. 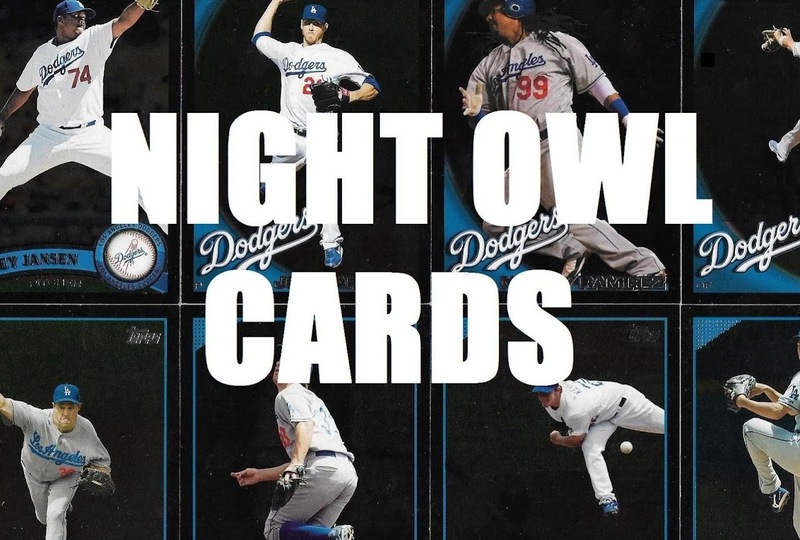 And they really need to be brought back ... permanently ... and in the base set. 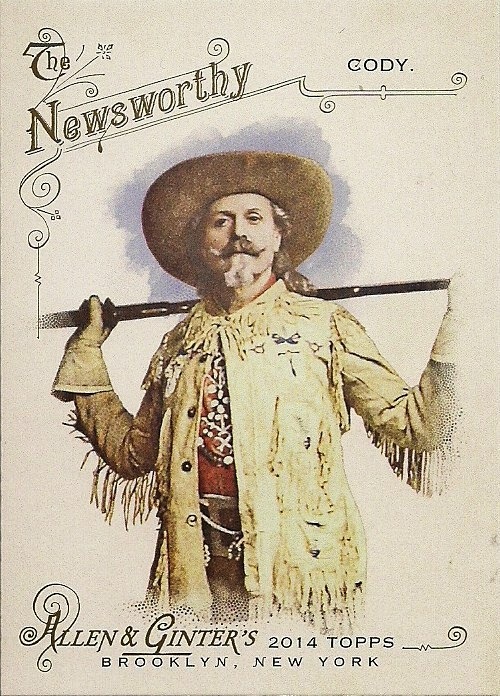 But for now, I'll just keep going back to my cards from the '50s, '60s, '70s and early '80s (and, oh yeah, 2006, too) for my 2-by-3 illustrated entertainment and information. Don't you love my overly dramatic post titles? I'm afraid you'll be disappointed if you're expecting some great truth to be revealed here. I'm just cleaning stuff off my desk this week that's been sitting there too long. This is a pack that was sent to me by Shane at Shoebox Legends. But the pack got me thinking. 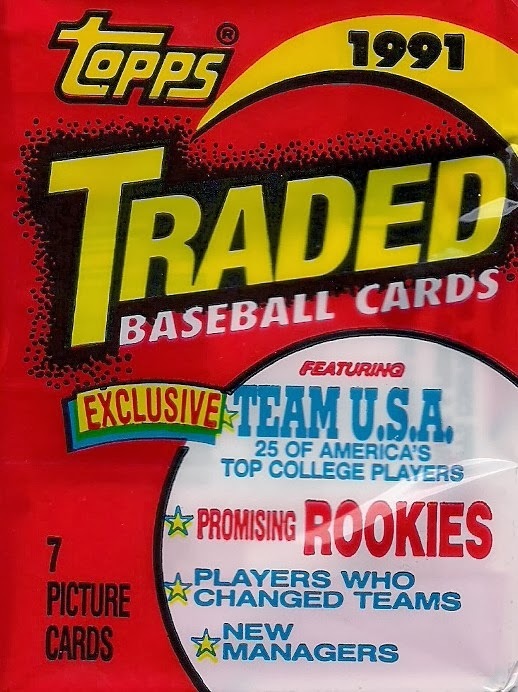 I have the entire 1991 Topps Traded set already. But I couldn't tell you how I got it. I probably bought the whole thing for 14 cents somewhere. And those three previous sentences, my friends, is a commentary on how far baseball cards have fallen in the eyes of its collectors. 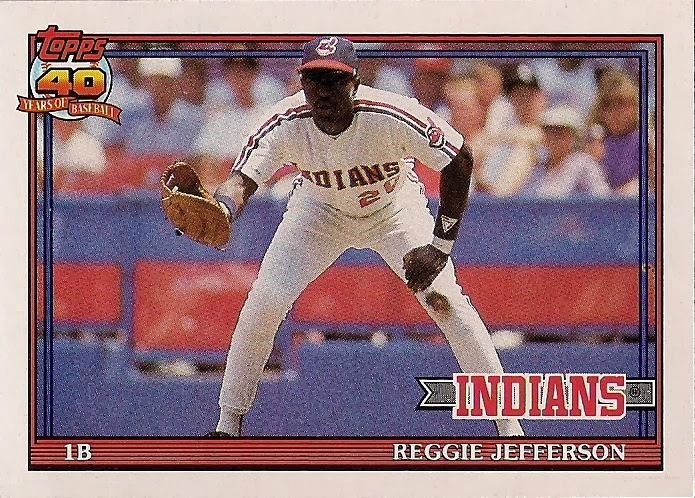 The 1991 Topps Traded set was issued 23 years ago. And it's treated with a dismissive shrug by many collectors. I let this pack sit unopened for weeks. But if you were to hand me cards from 23 years ago when I was, say, in high school, I would flip out. Cards from 1959? Are you kidding me? These are the most precious items in the world! 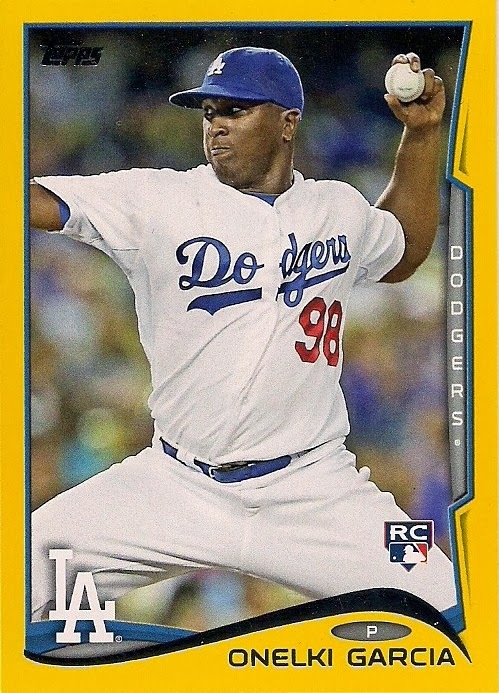 That, to me, sums up how far baseball cards have fallen off their pedestal. 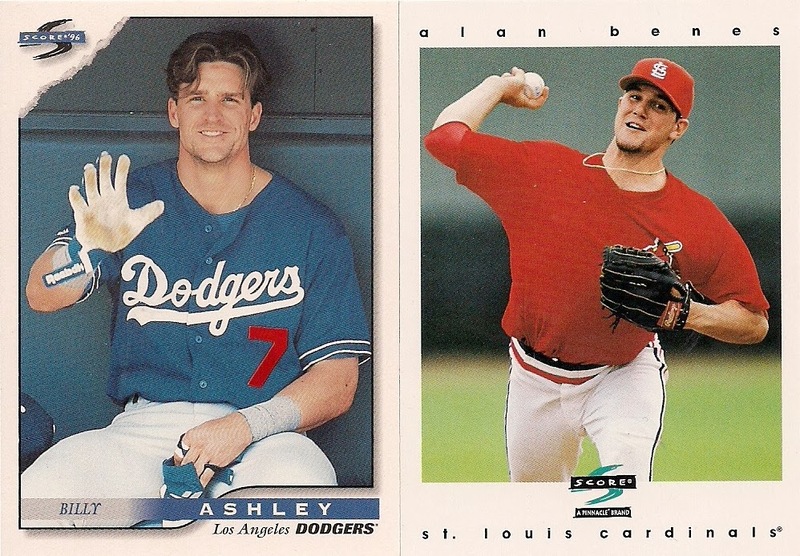 Sure, there are still precious cards being made and coveted cards being made, but I don't know if a mere 23 years distance is enough for anyone to care anymore. So, after throwing cold water all over everything, let's open this pack of cards!!!! I'll try to say something happy over the next seven cards. Well, well. 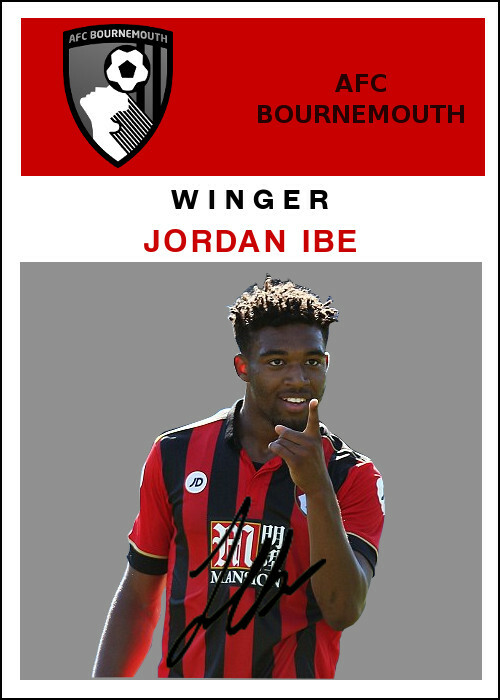 I think this is one of the PROMISING ROOKIES that the pack wrapper advertised so enthusiastically. 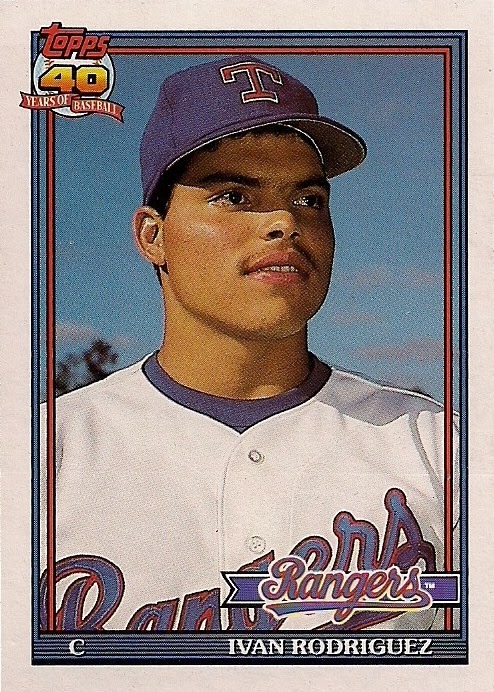 Outside of the Jason Giambi USA card, Rodriguez is the most valued card in the set, and I pulled it right out of the gate. 1991 Traded's trying to show me what it's got after all that bad-mouthing up top. This card always bugged me because you can't see his face. It's much worse in person. 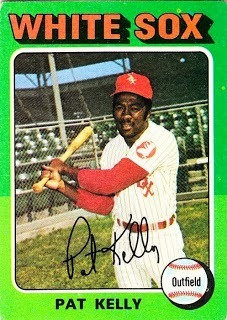 One of three Pat Kellys to play in the majors. This will always be Pat Kelly to me. 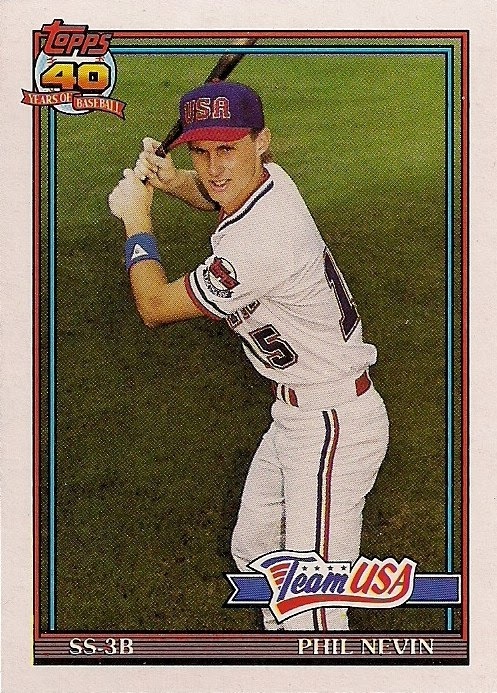 These USA cards bored me back in the day, and I haven't progressed very much because they still bore me. But mostly what I notice is how skinny Nevin is. I need to do a study on whether a 50-pound gain between college ball and mid-major league career is normal. 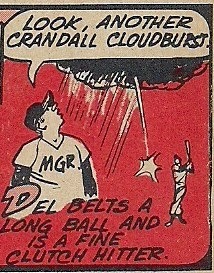 Candiotti is hiding it, but there's a knuckleball coming. 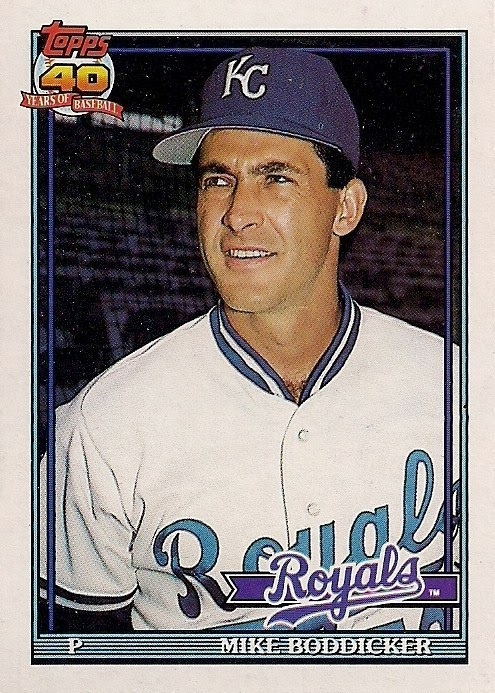 I can't say I remember Boddicker as a Royal. Don't remember Stubbs as a Brewer either. Well, that pack went south quickly. 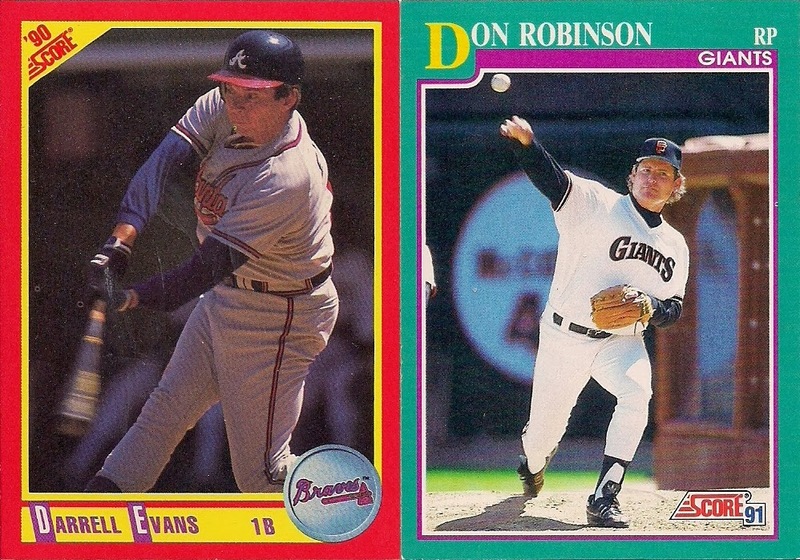 I suppose the best thing I can say about 1991 Topps Traded is it might be the last set ever made on traditional gray cardboard (yes, that's a challenge -- knock yourself out). I probably should respect it more just for that reason. I'm sorry I said all those bad things about you '91 Traded.